If you are going camping during the summer, it is important to always consider that the weather can be extremely hot at times. Staying cool when camping in the summer is not just a matter of comfort. Doing so can help avoid developing heat stroke, dehydration and other potentially deadly complications. We’ve collected a super cool-you-down checklist for your next hot summer camping day! Small Country offers gorgeous Lake Ruth Ann, our giant lake toys, two sand beaches, boats for rent, as well as a pool for your water based activities on hot summer days, sure to cool you down. Even take a cold shower! A classic way to try to beat the heat is to get out of the sun and find shade. At Small Country, where we are surrounded by many mature and gorgeous trees, your shady hideout should not be hard to find! Perspiration draws water out of your body, which must be replaced frequently. Don’t forget to frequently hydrate – water, sports drinks, electrolytes all will help replenish your body. Avoid alcohol and caffeine. No, I’m not the fun police. However, cold water will do a much better job at cooling you in a heat wave. Soak a towel or bandana in ice water and wrap it around your neck or head. This will also work if you dip your hat or cap in ice water. For a towel with some advanced cooling technology – check out the Enduracool towel – according to Mission, the Enduracool towels cools to 30 degrees below your average body temperature. The claim is that their technology causes the water molecules to circulate in a way that causes them to be cooler and evaporate slower, not to mention the camo bandana makes you look like a total badass. A misting system can help keep cool you trough evaporative cooling on hot days in camp or on the go. A misting system is as simple as bringing a spray bottle along with you on your outdoor adventures and spraying cold water on your face when you need relief. Ice packs are commonly used to either keep your drinks or lunch cold, but they are actual dual-use products that you can put on your body to cool you down. As long as the pack is kept insulated, there is no reason why putting an ice pack on your forehead or the back of your neck won’t cool you down. Wearing a lightweight brimmed hat is great to help keep the sun off your face. Hats with flaps on the sides and back also can help you keep the sun off your neck and ears, and cool you down in the process. Wear light colors and light, breathable fabrics. Try flowing cottons and linens. Use battery-operated fans. Place a bowl of ice in front of it for even cooler air. And don’t forget that at Small Country – there are cool drinks available at the shop. Keep cool and keep safe this summer!!! We’ve collected the best of the best advice on how to repel mosquitoes during your camping trip. Take a look at our exhaustive list below and pick a few options to add to your gear on your next trip! Mosquitoes just don’t like these oils, so when you put them on your skin they won’t like you either. Mix a half teaspoon of lemon eucalyptus essential oil with a cup of water in your spray bottle and apply to your skin as you would any other spray repellant. The most effective method of warding off mosquitoes is to identify and destroy their breeding sites. Locate the sources of standing water within a radius of several miles. Mosquitoes prefer still water for laying eggs and usually steer clear from aerated or circulating water. Common sources of standing water include: puddles, buckets, bird baths, rain gutters, downspouts, ditches, garbage cans. The gambusia fish, also known as the western mosquitofish, eats mosquito larvae. Dragonflies are a top predator of mosquitoes – dragonfly larvae live in the water and feed on mosquito larvae, and adult dragonflies eat adult mosquitoes. Other species with an appetite for mosquitoes include ants, ground beetles, spiders, water striders, frogs and snails. Birds such as purple martins and bats have also play a role in managing insect populations, including mosquitoes. Some gardeners swear by certain types of geranium plants to keep mosquitoes at bay. Others grow lemon thyme and lemongrass to yield oils that are supposed to serve as effective insect repellents. Other herbal remedies recommended for battling mosquitoes include mountain mint and even basil. Citronella candles, which contain oil made from lemon-scented plants that are native to Asia, have long been used for this purpose. Citronella is an oil that is considered a natural insect repellant. Many companies make candles infused with citronella oil and a few lit candles can be effective around camp. Though they aren’t typically strong enough to ward away the masses, citronella candles do minimize the bugs. Scientists have also reported that oils found in catnip can be effective at repelling mosquitoes. Put on light-colored, loose clothing (mosquitoes are attracted to darker colors). Nothing beats an old-school house fan. It’s clear that mosquitoes avoid flying through a 10-mile-per-hour airstream. The fan also provides steady wind while diluting and dispersing the carbon dioxide you exhale — a major chemical known to attract mosquitoes. However, fan control solutions may be difficult at campsites without electricity.Mosquitoes can fly but they are terrible at it. You can use that to your advantage by using a fan and blowing it across the area where you will be sitting. It should be just enough to disrupt their flying and they will avoid the area because they feel off balance. If you don’t have electricity, hope for a good, steady breeze. Lavender has considered a natural insect repellant and a number of sunscreens have lavender oils for a little-added bug protection. Avon’s Skin So Soft products are considered by many people to be the most effective insect repellant that does not contain DEET. Garlic is also thought to ward the bugs away, but you’ll have to eat a lot of raw cloves to see any results. Many people swear that garlic steers bugs away from them. It doesn’t hurt to try, so why not add a few extra cloves of garlic to your dinner! A few outdoor clothing companies make clothing with insect repellent in the fabric. These shirts actually work well. You can also by a wash and treat your own clothing. The advantage of wearing treated clothing is that you don’t have to put toxic creams or sprays on your skin. Mosquito coils can also be effective around your campsite. The pyrethrum-infused coils emit a repelling scent and smoke. A few coils placed strategically can help decrease the mosquitos. There are camping lanterns that are customized for insect repelling. A removable cartridge on these lanterns emits a scent that fights the bugs and keeps them away from the lantern’s vicinity. These insect repelling lanterns have removable cartridges that need to be replaced. When all else fails, the clothing, the repellant, candles, coils and lanterns just won’t keep the bugs away, consider a screen room. Try to purchase a screen that has openings that zipper from the bottom up and are located in the centre. The D-opening style I would not recommend if you are a family with small children, as they are a tripping hazard. Remember to make sure the entire bottom of the tent is sitting flush on the ground. Place rocks on the lower flap. Mosquitoes are heat seekers, so even the tiniest of holes allows them to enter. Not only is coconut practically the official smell of summer, but it’s also said to be a natural bug repellant. Use coconut soap to wash yourself, and finish up by rubbing coconut oil into your skin. Bugs should steer clear, and your skin will be gloriously soft. Aside from a little coconut, you should aim to smell like nothing at all. Bugs love our fragrant perfumes, colognes, shampoos, shaving creams, deodorant… the list goes on. Opt for unscented products to blend into the environment as well as possible. The number one chemical product on the market is NN-Diethyl – Meta-Tolumide or as we know it “Deet”. Although it is harsh in smell, Deet does work wonders. Natural Peppermint oil can be dabbed directly on skin, clothing, picnic table, umbrellas, tent‘s or wherever you need protection. You know summer has begun when the pool is open. Not all campgrounds in Virginia offer camping beside their own outdoor pool! Today we’re diving into a celebration of all of the ways to enjoy our own outdoor pool at Small Country Campground by unpacking all of the reasons families love summertime at the pool! It's not really summer until the pool opens. Our families can't wait to head the pool! The best part - it's good for the body, engages the mind, provides an escape from the heat, and it's social time - where every child to enter the gates is a new play mate! You know the thrill of hitting the water after a hot summer day -- the sound of your splash is followed by the chill as you're surrounded by water. There's nothing like it! There's something about the water, isn't there, that just brings out the child in everyone... especially children! And nowhere is that more visible than at the pool. There's something about the safety of moving in the water that brings out our craziest moves! Many of our most powerful childhood memories are based at the swimming pool - conspiring mischief with a buddy, inventing a game, attempting a physical feat or to bug the girls... some of the greatest friendships are forged by the edge of the water! Spending time in a swimming pool provides a level of comfort with water. In time, these skills evolve and accumulate into strength, ability to float and swim, ability to hold and control your breathing. It gives peace of mind to know that no matter what water adventures might be in the future, these skills may equip your family for survival! Everyone remembers those moments when your dad holds you up in the water - teaching you to float - and promises not to let you go! What a beautiful image of the types of parent child learning experiences the pool brings! Swimming is one of the best low-impact exercises - every member of your family can enjoy a workout without the impact. Cardio gets your heart rate up - giving your lungs additional strength. There's something about getting out in the water that calms the mind and soothes the soul. While we do definitely take fun seriously, Small Country also attracts couples seeking some quality time away in nature - and floating in the water offers that to you in a way that nothing else can. Enjoying the pool outdoors lead to an increased confidence, improved creativity and self-esteem. Natural settings rejuvenate and calm the mind and improve outlook. This may also improve your mood, as well as reduce stress, anxiety and depression. Here at Small Country Campground we take play very seriously!!! We’ve been working hard to add new ways to play and prepare for summer fun ahead of schedule! Take a look at our upcoming events through 2017 now available online and set your time to enjoy all the fun and recreation camping here offers! Enjoying the outdoors may have more long term benefits to your health and well being than you realize!With the fantastic weather we have been experiencing this February, our campers need no additional motivation to get outside and enjoy the outdoors already this year. What you might not realize is camping can help you live a longer, healthier life. Health benefits are not usually the motives that guide our families to pack up for the weekend and escape to Small Country Campgrounds. The reasons we hear most frequently are the desire to escape, get away, spend time with family and rest. Whatever your reason, your experience may be all the more rich knowing these additional benefits your health when you come visit us. When you spend time among trees, you take in more oxygen. The first breath of fresh air when you arrive at a campground is more than you might know — the rush of oxygen releases serotonin from the extra oxygen resulting in happiness. This supports the reduction of stress. The oxygen and lack of pollutants can add up after a few days outside – and over time you can see benefits in improved blood pressure, digestion and a boosted immune system. Further, the happiness benefits last days into your return. The sunlight can even out melatonin levels — the chemicals that make you feel tired, depressed. Not to mention that sunlight creates Vitamin D an important component for your body to absorb calcium and phosphorous. Not just being in an enjoyable environment, but developing an appreciation for nature and respect for the world around us. A dose of fresh air is exactly what is needed to reset our bodies and prepare us for what’s next. The physically and intellectually stimulating activity have a great effect on brain health. With devices every where you turn, meaningful relationships, quality sleep and stress levels suffer. Leaving the devices behind creates a space for reflection, for your spirit to refresh and for quality time. When you spend time outside, you are also being active! Swimming, hiking, building a fire, or even grilling – all the activity adds up! And we definitely agree that when you take play as seriously as we do — you are always moving! Even fishing is an activity that requires more movement than sitting at an office. It’s hard to find a moment of quiet in the daily grind. Getting away in nature can offer you some much needed rest, reflection and time for some peace and quiet. A campsite offers a special kind of quiet — under the stars, beside our lake, and listening to your crackling fire and our birds and cricket friends. The meditation may improve serious medical conditions like depression, fatigue, or even allergies – by increasing self awareness and stress-reduction, camping can improve your overall health. 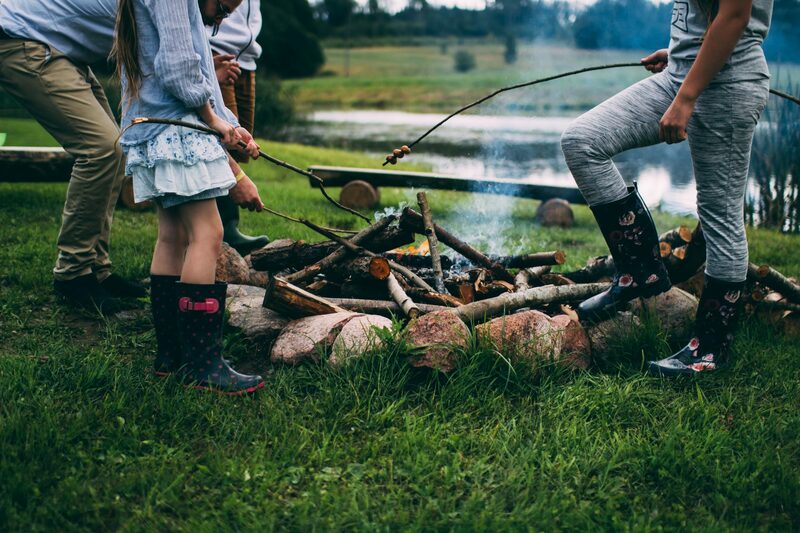 Bonding around a campfire is a safe, family friendly experience that cannot be duplicated. Quality conversation can be rekindled while you are nurturing that campfire. Quality time with friends and family can extend your lifespan and delay memory problems. We hope you are having a fantastic end of the winter season and as excited as we are for the camping season to ramp up! Take a look at the upcoming events and the many way to play! We look forward to seeing you at Small Country Campground soon!